We have been sad lately. 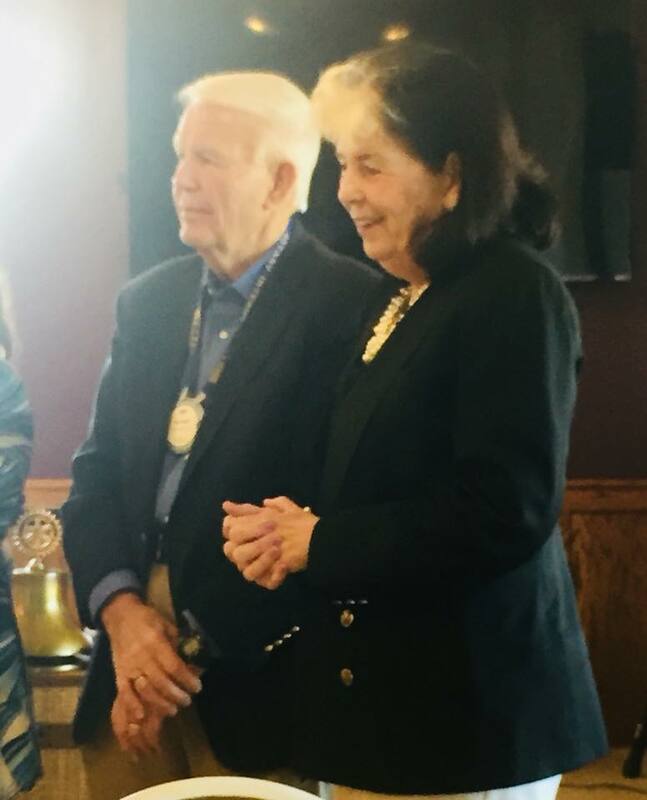 Two more of our dear elderly Rotarians passed away. Jim Sikora and Bob Mazurek. 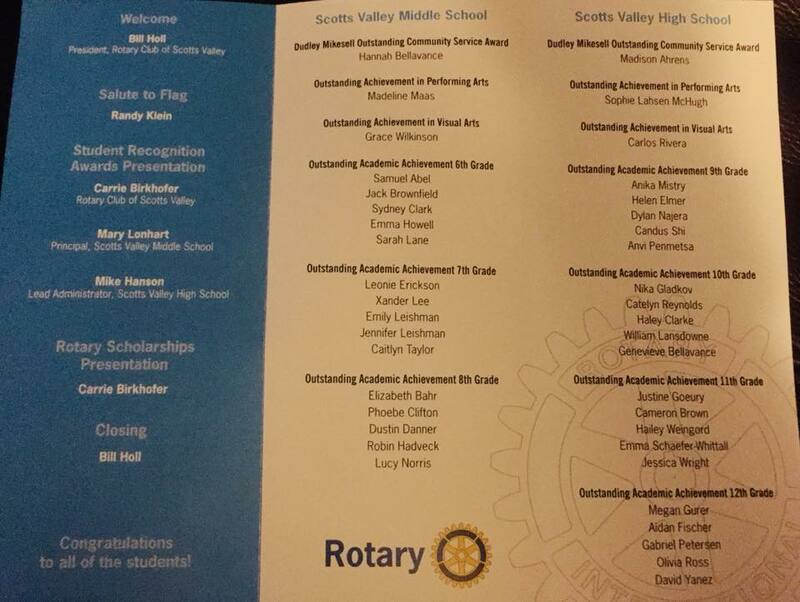 Instead of just being sad we like to celebrate their lives, as they were great people and Rotarians! We will miss them dearly. 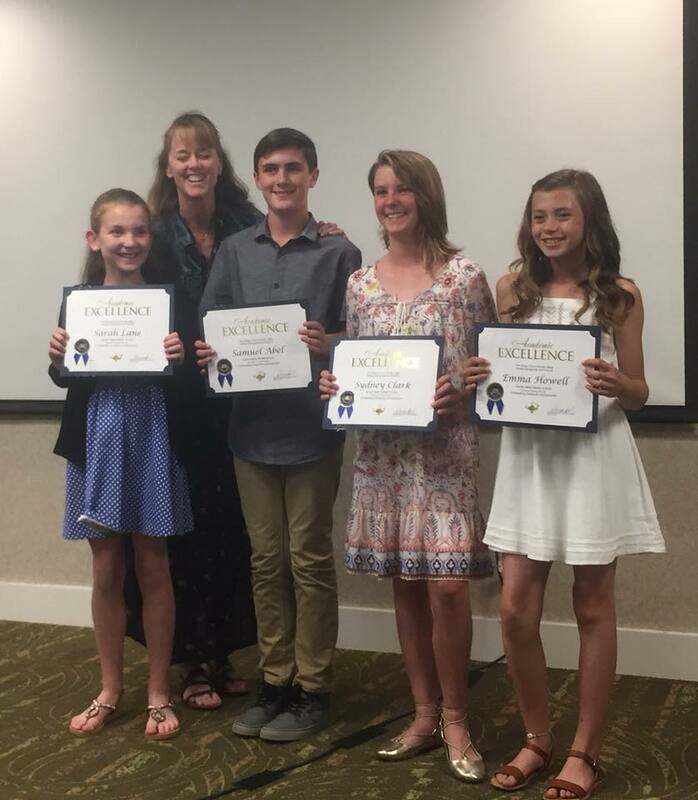 We like to share their many accomplishments and Rotary work and will do so as their families become ready. 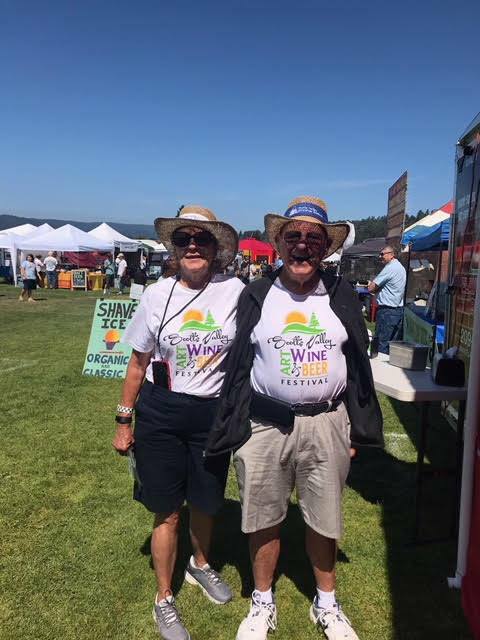 See Bob Mazurek in this picture, with his wife Julie, just a few months before passing in his 80's volunteering at the Scotts Valley Art, Wine and Beer Festival! Bob was a steady participant and rarely missed any meetings! 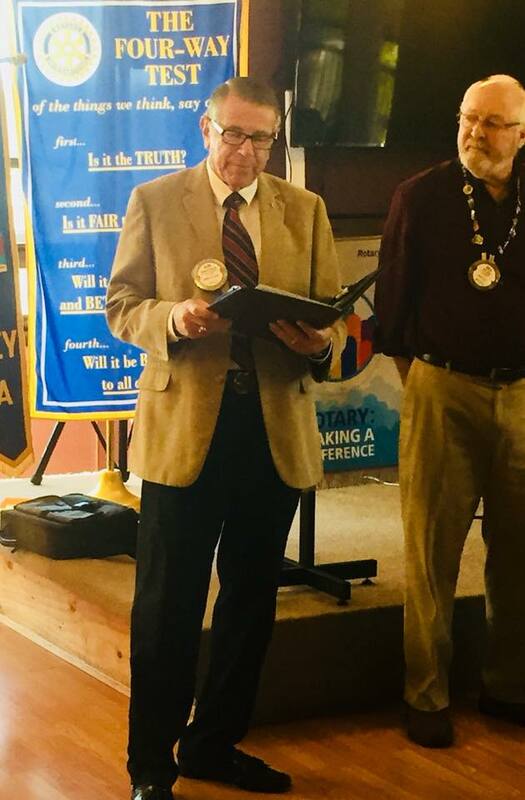 Bob and Jim were members of the Scotts Valley Rotary Sustainability Committee. May they Rest in Peace! 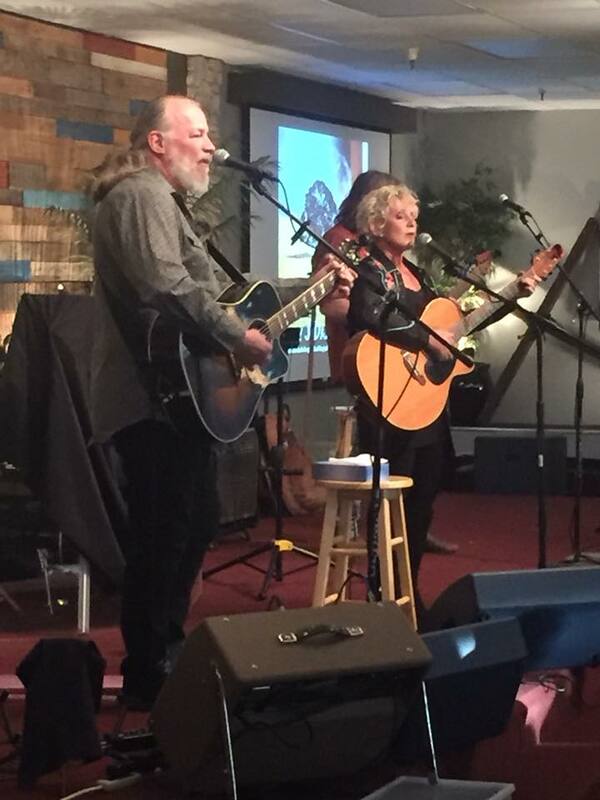 We send all our love and strength in this difficult moment to Bob's wife Julianne Mazurek, and to Jim's wife Marie Sikora. 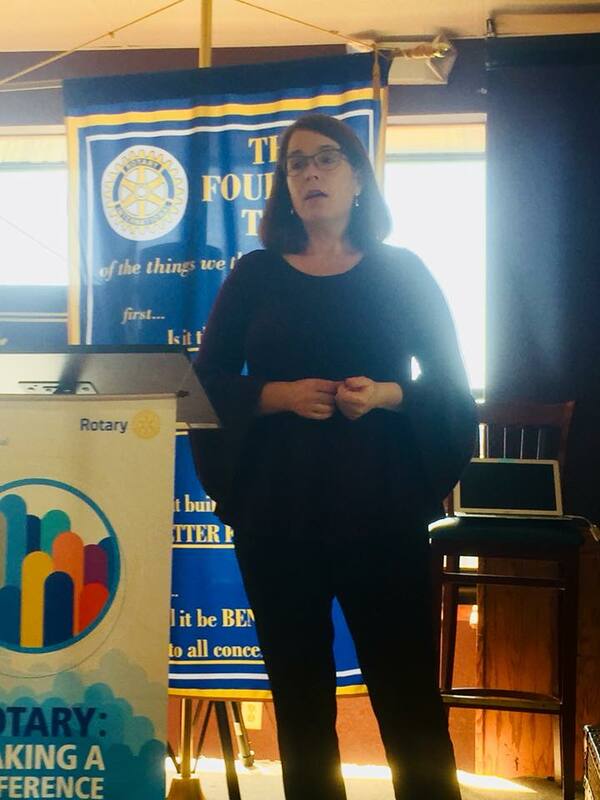 Michelle Sudfeld, Director of Administration/Orphan Programs at ASSIST INTERNATIONAL gave us an encouraging, energizing and inspiring presentation! 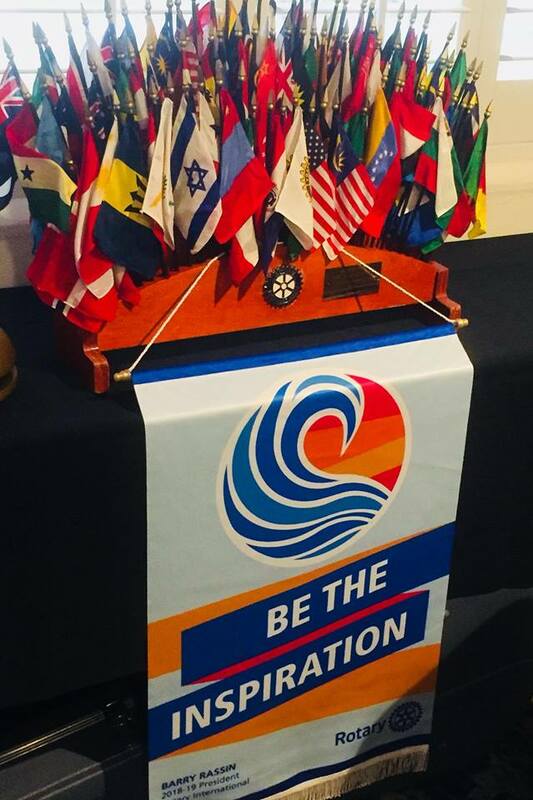 It is difficult to find a better organization than Assist International to represent the spirit of Rotary - Service Above Self! Addressing the needs of the world’s most vulnerable people. 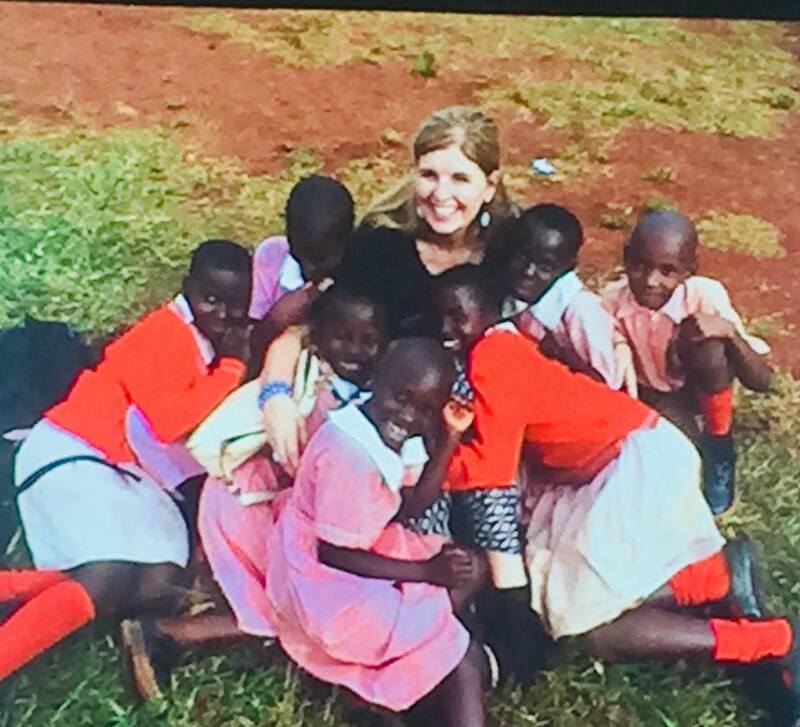 Michele is passionate about rescuing Orphaned and Vulnerable children in developing countries. 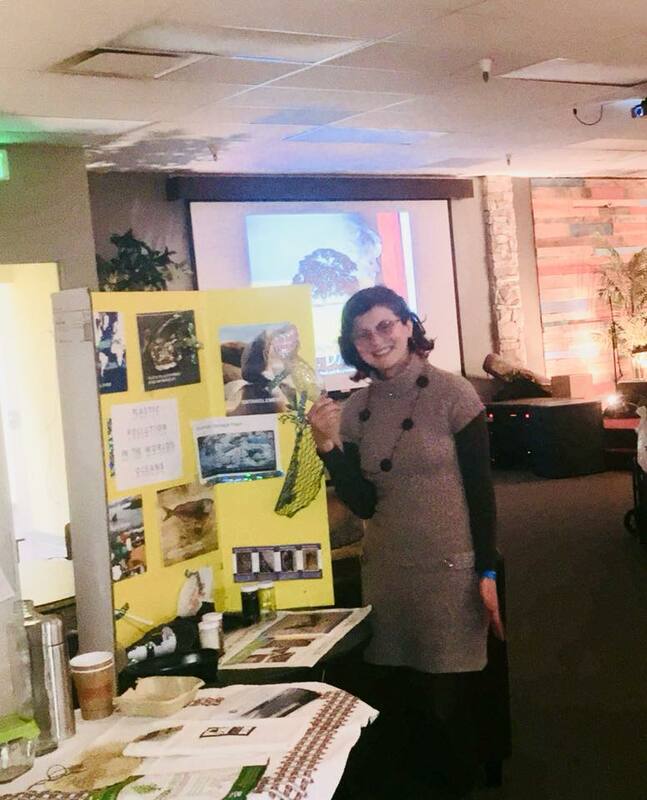 She works closely with Assist International partners in Africa, Romania, and Thailand. One child at the time! She oversees building of homes and schools for the children and ensures Assist International’s orphan villages are viably sustained through donor support and enterprise solutions! 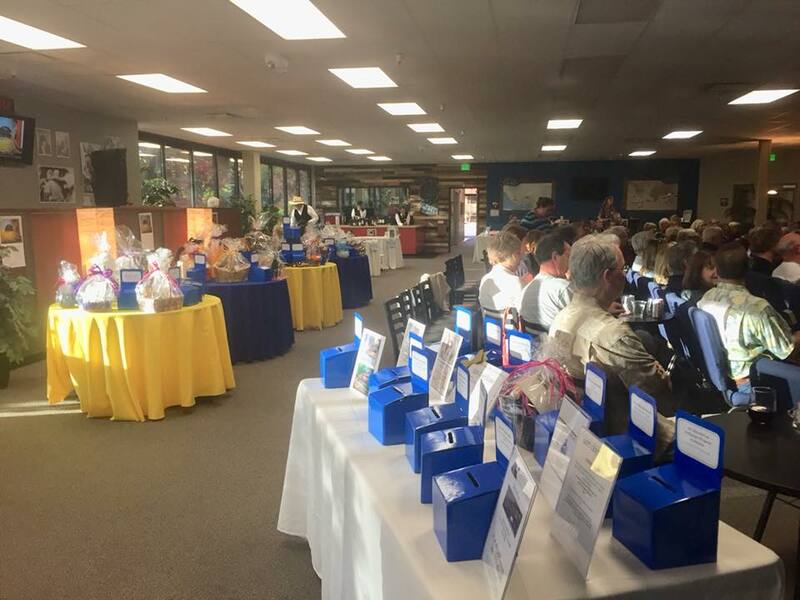 Randy Klein from the Tutoring Club represented so well our Rotary Club at the Scotts Valley High School -Welcome Back to School event. 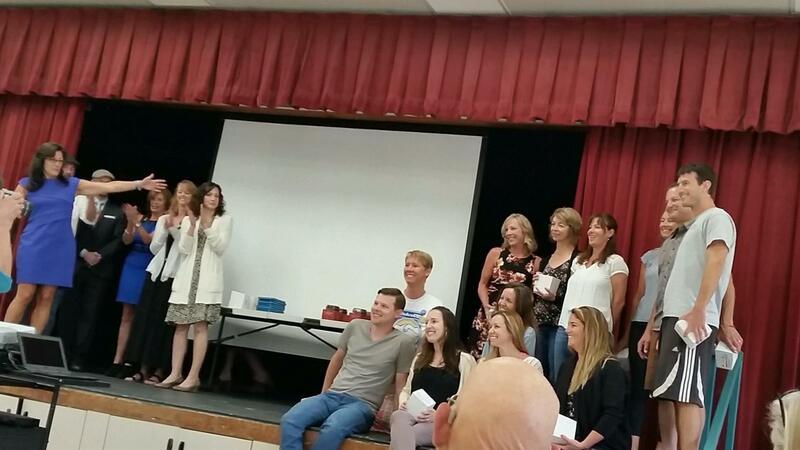 A very well attended, high energy event where the community shows the teachers their gratitude and support. 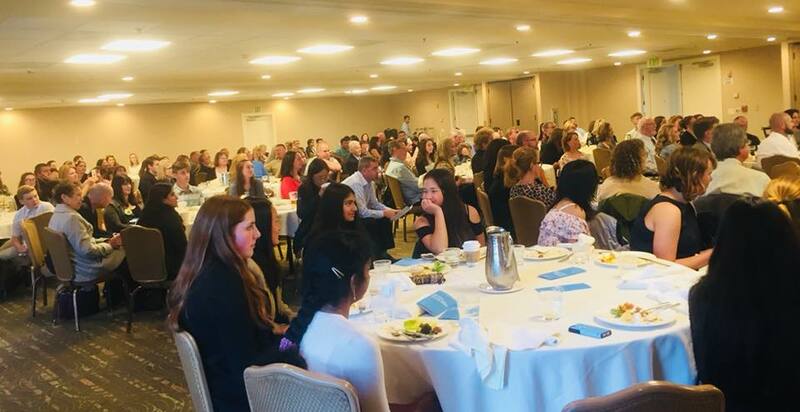 Jonathan Hicken, Director of Development & Partnerships at the Santa Cruz Museum of Art & History(MAH) made a great presentation, and showed us how a museum can do its part in connecting the community! Jonathan was an Executive at a successful Silicon Valley tech business and a published academic who wrote about undocumented migration along the US- Mexico border. He is passionate about building a stronger community and has so much to show for the success of the Museum in this area! Other communities may want to learn the secret of this great success. 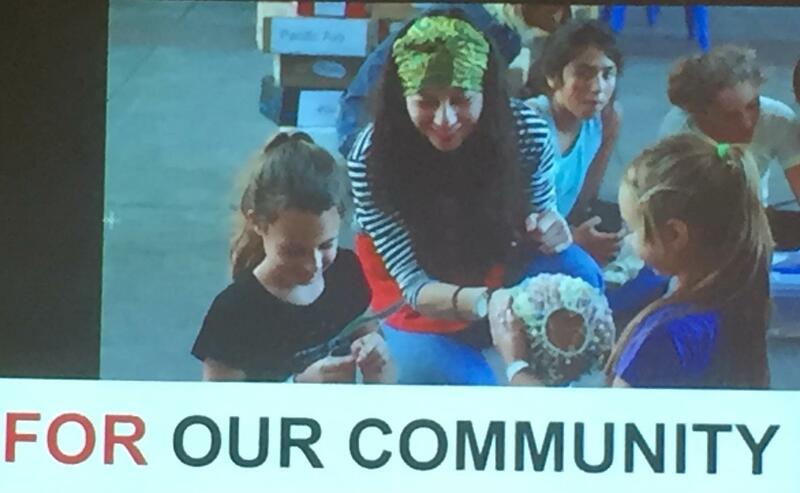 How to bring Museums alive by connecting all types of people and generations while they learn and have fun together. 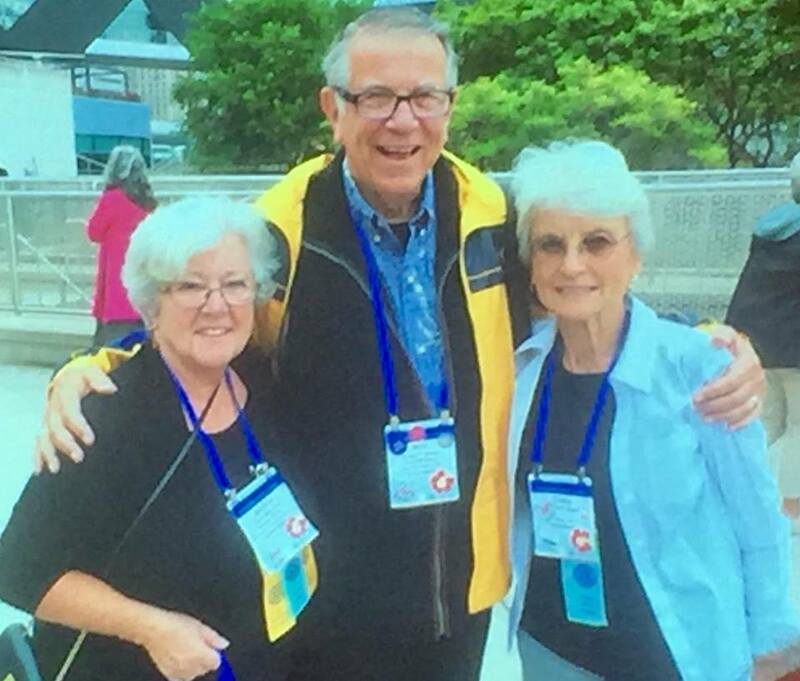 Ron Sekkel here with two other very special Rotarians, Jean McClaren and Cindy Sekkel, his wife! Rotary District 5170 House of Friendship Booth. 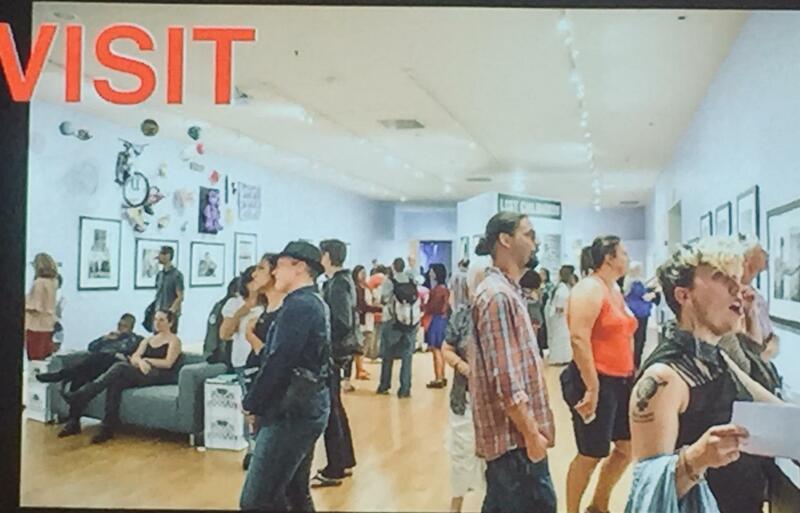 Hundreds of booths representing projects from all the approx. 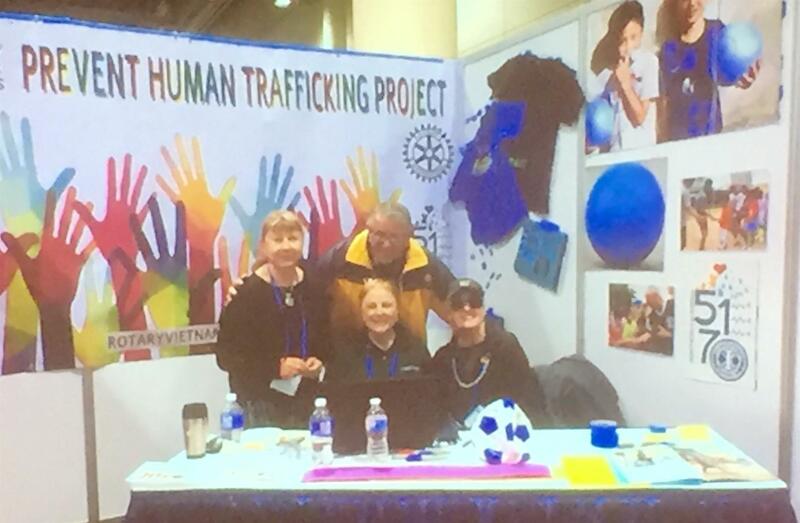 27,000 people attending this Convention were in display at the House of Friendship- support, participate, or just learn and be renovated in your hope for this world! Rotarians at work! Ron Sekkel, Bill Holl, Patrizia Materassi, Cindy Schuette, Randy Klein and Bill Schuette in the back of picture. 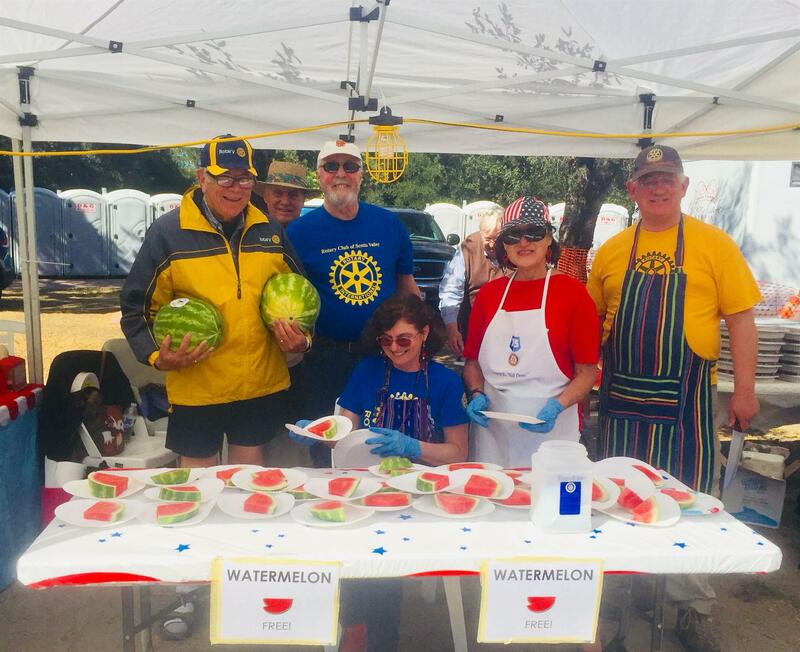 Kim Shultz, Patrizia Materassi, Kelly Ann and John Hale, Ben Hicks, and Bill Holl— water melons were cold, sweet and juicy! Company a pleasure to work with! Cynthia Sekkel and Kelly Ann Morgan. Kelly all the way from Florida helping at the booth! Human Race cheerleader/MC-Sunrise Rotarian Rod Caborn with Scott's Valley Rotarian-walker, Cindy Schuette shown here after the annual Human Race Walk. 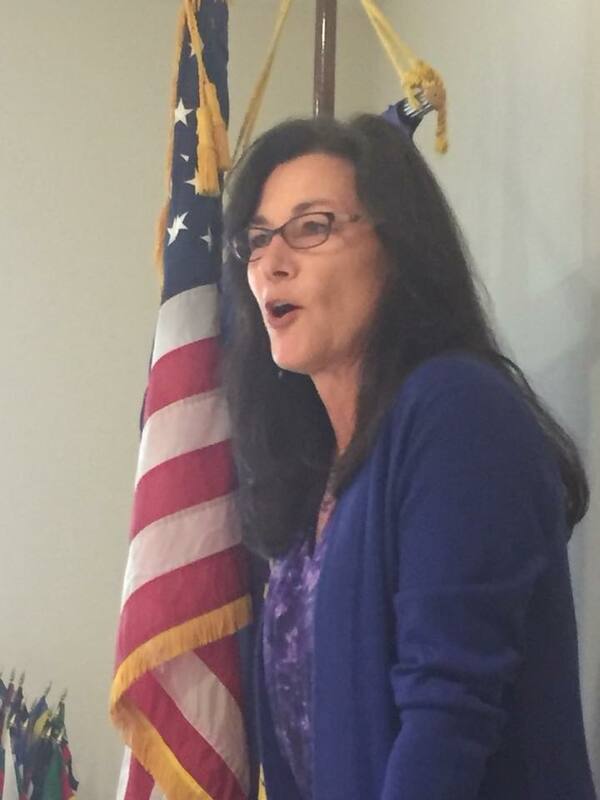 Cindy thanks the Scott's Valley Rotarians for their donations for the Tourette Association of America** and Volunteer Center being a Champion Team. Cindy thanks you for your ongoing support. 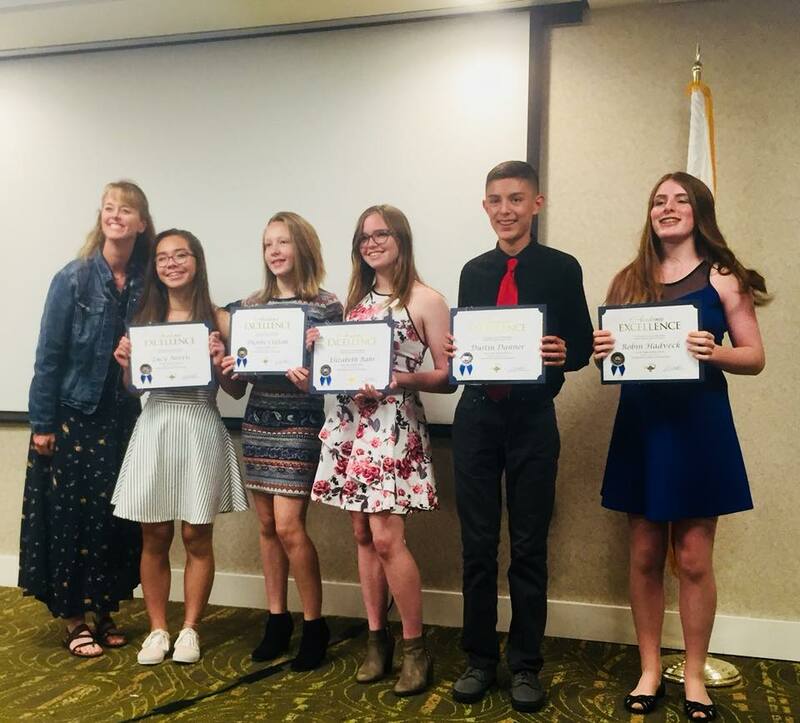 ** The Tourette Association of America ( Previously known as Tourette Syndrome Association of America) funds are used for education, awareness and advocacy. 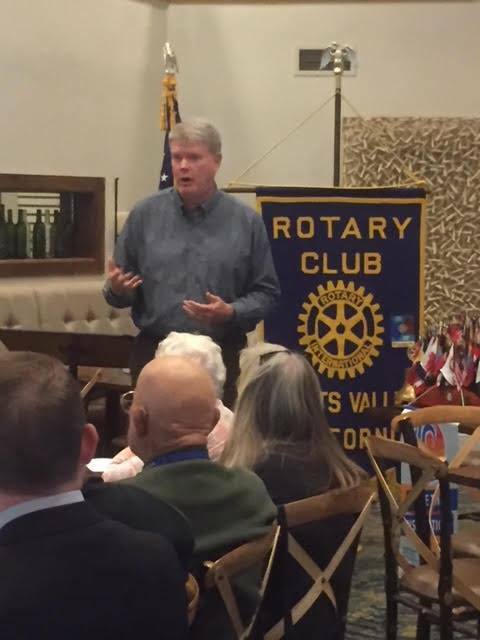 Tim Lindell, the Governor of our Rotary District 5170 came to visit and shared District and RI news with us. His District Theme is Learning, Leadership and Inspiration. 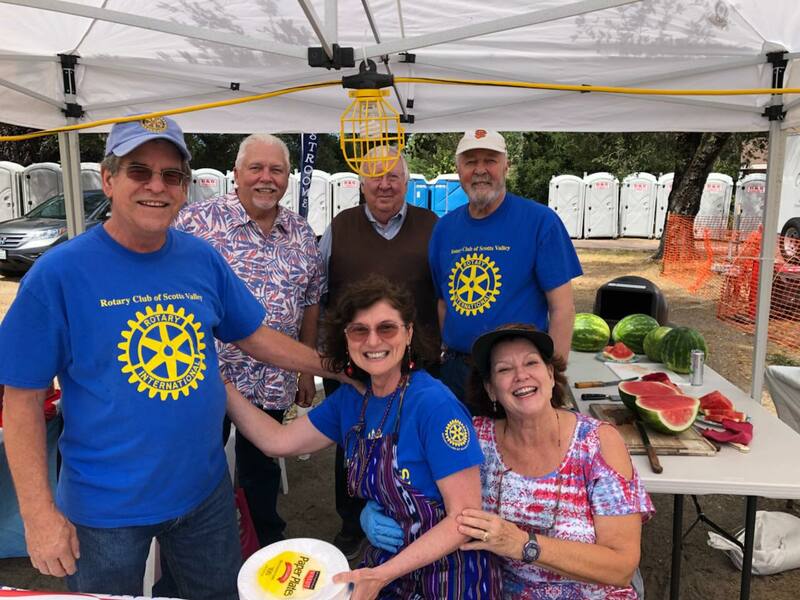 Rotarians are encouraged to learn more about Rotary, so they can be confident leaders in the community, and inspire many others ! Tim comes from Portland, Oregon, an Attorney at Law in active practice. 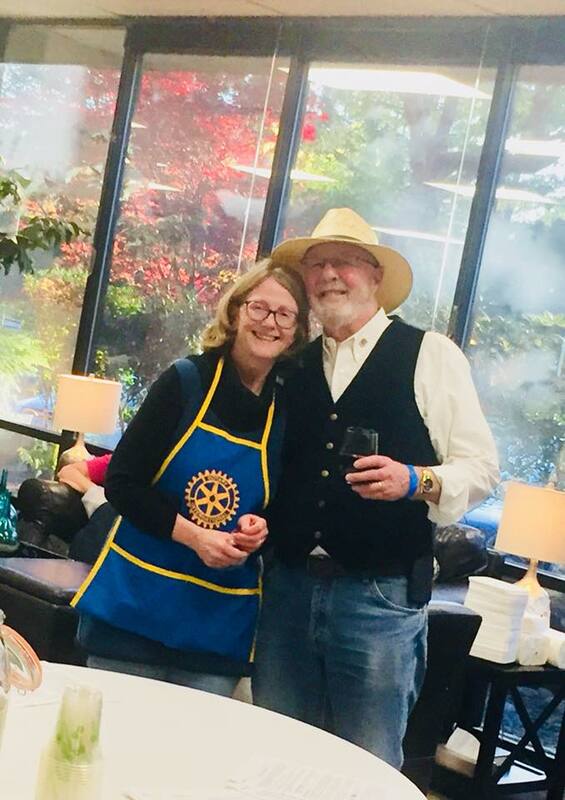 Community service, through schools art and music, sports, and local government, and now Rotary have been a huge parte of life for Tim, and for his wife, Penelope O’Neil. 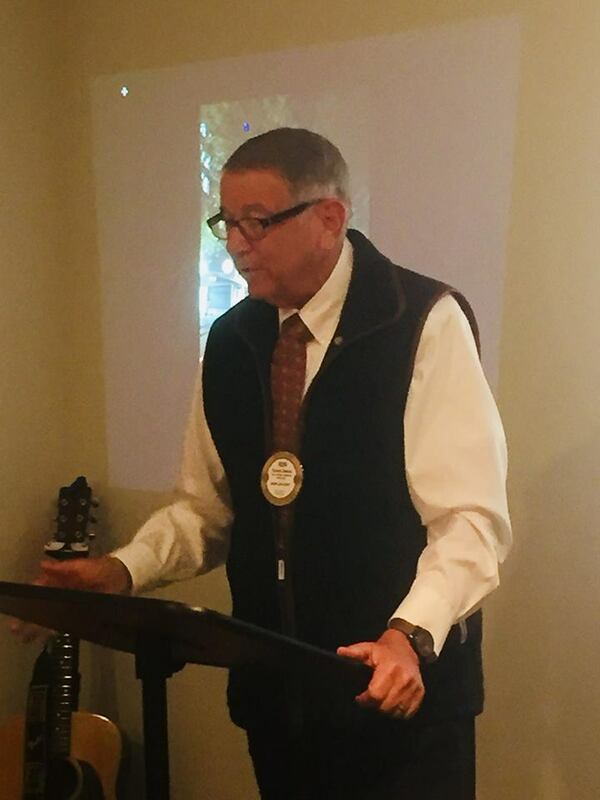 Tim served as President of Los Gatos Rotary Club in 2004, and 2007-2008. 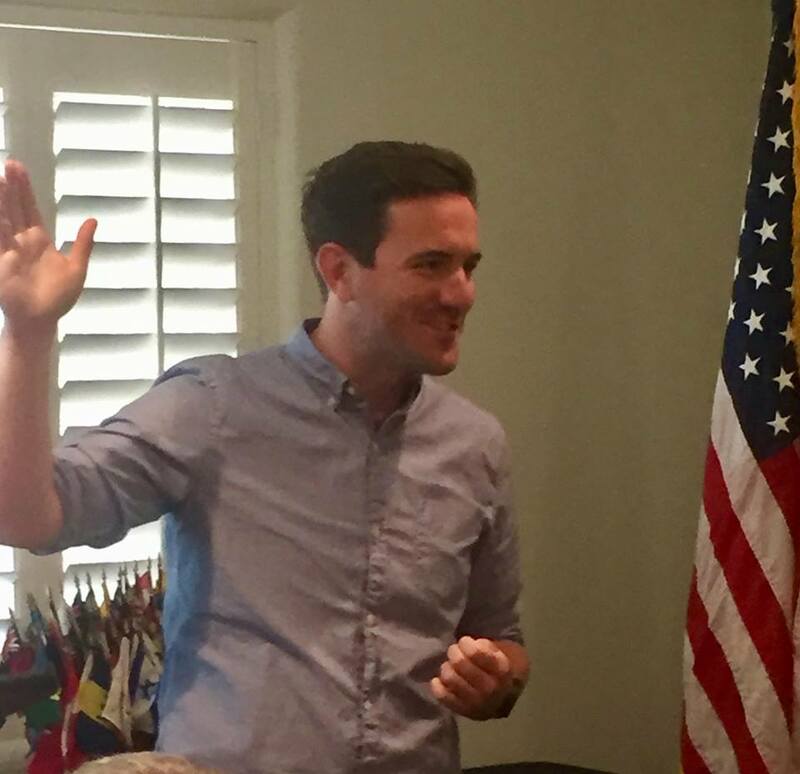 He has been Assistant Governor, District Conference Chair, and District Trainer. 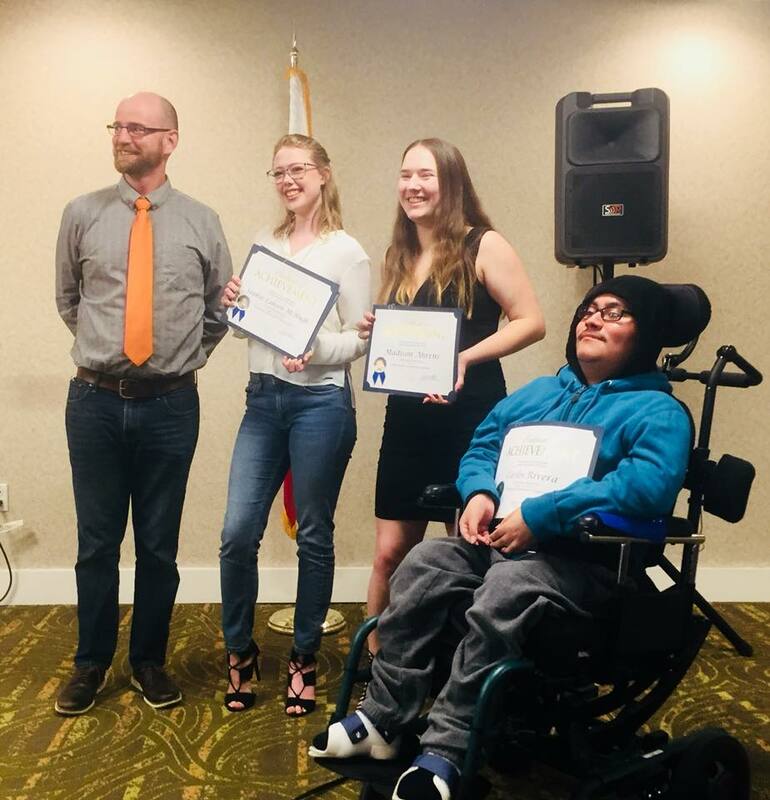 Past recipient of the District Rotarian Award of the Year, the Richard King 🥇, and Carolyn Schultz Award. 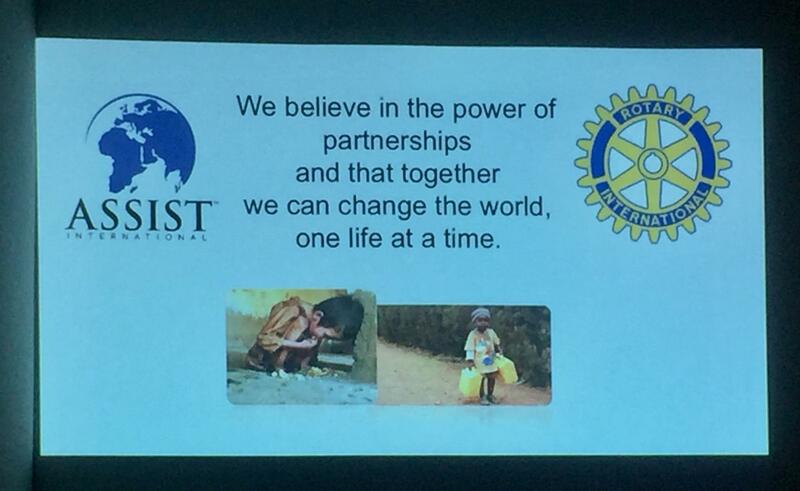 Here the RI new President’s moto: Rotarians BE THE INSPIRATION for people to join us in making this world better! 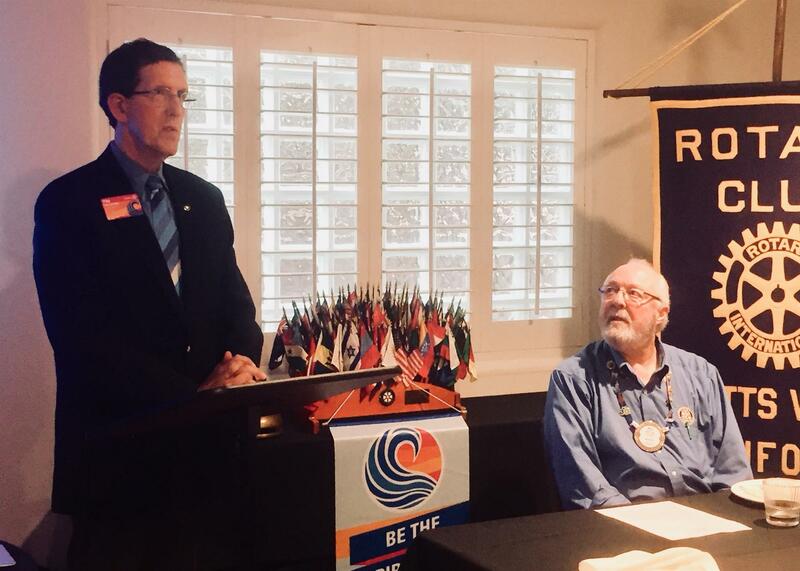 Our District Governor believes the survivor of service organizations like Rotary depend critically on nurturing the commitment of tomorrow’s adults in community service. 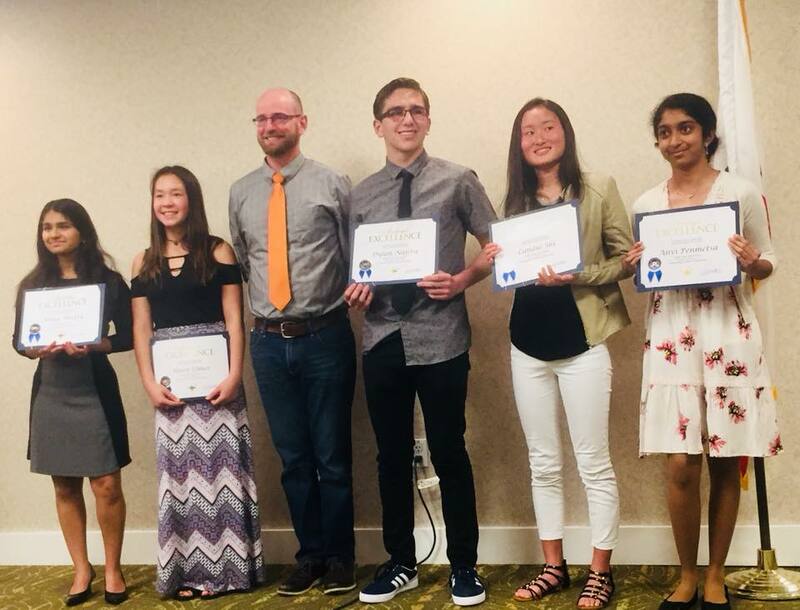 Rotary’s Youth Programs will continue to be a focus of his efforts in the District. 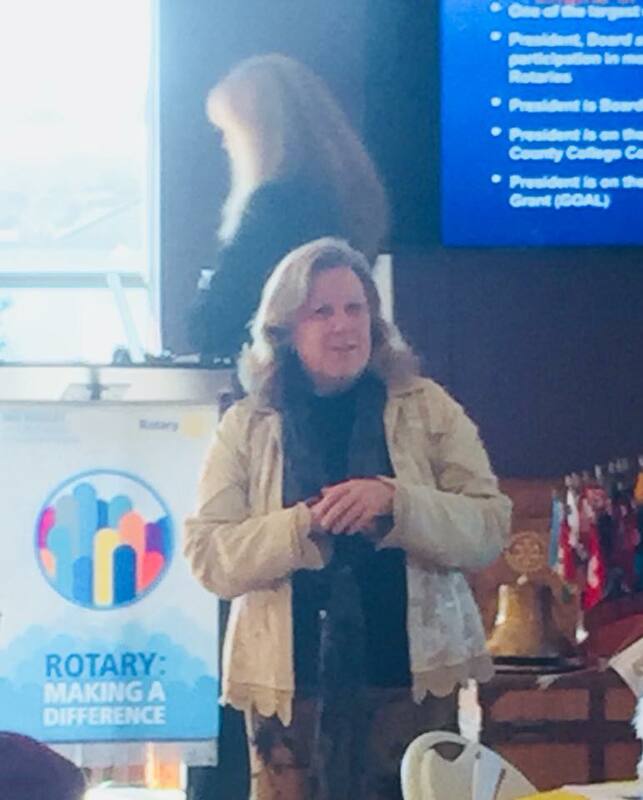 Janet Janssen presented at the Rotary “On the Hood of the 1964 Thunderbird”- looking back at a funny event in her adolescence that generated resentment but also helped build character! 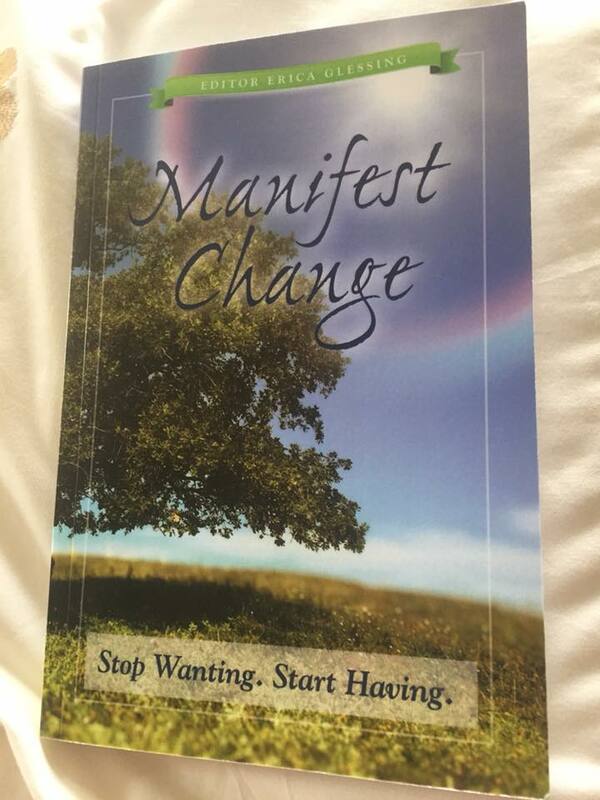 She has a new book. 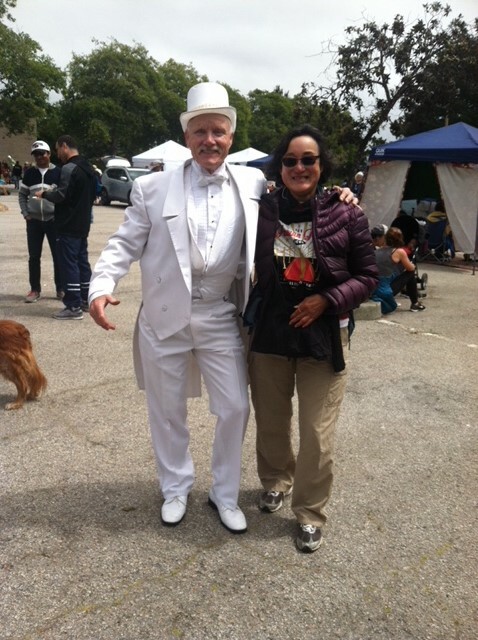 It turned out to be a well attended wonderful event! 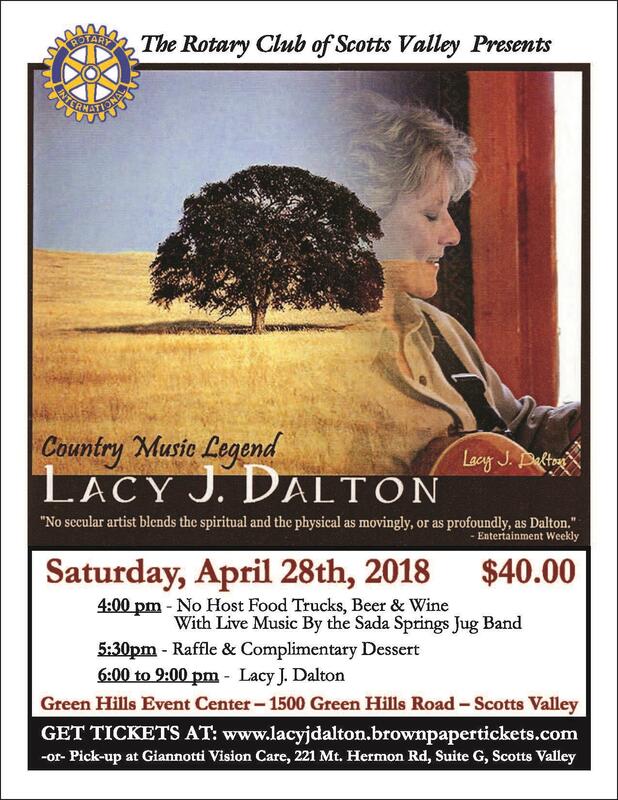 It all started outside with the sound of the Sada Springs Jug Band under the Redwoods and continued for almost 2 hours of beautiful singing of Lacy J. Dalton and her musicians! 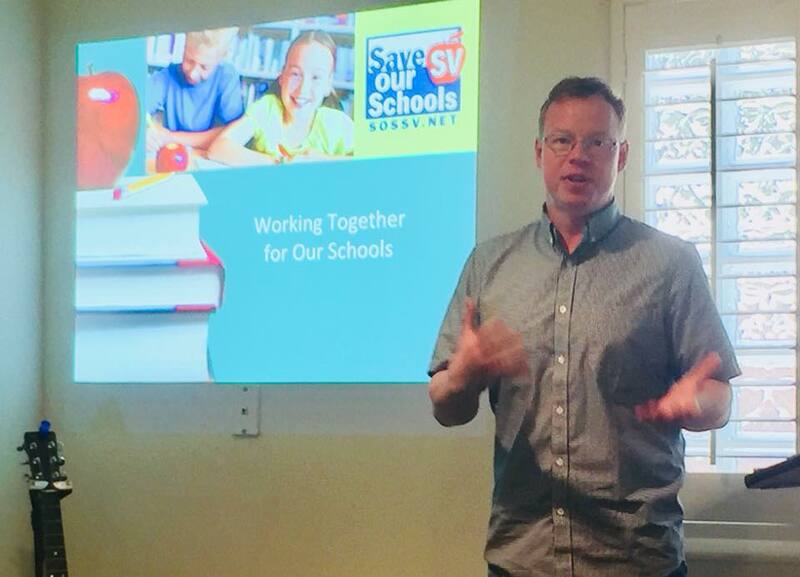 Tanya Krause, Superintendent of the Scotts Valley School District (SVUSD), and Derek Timm, President of the SV Education Foundation made a presentation on a parcel tax being considered by the Board. 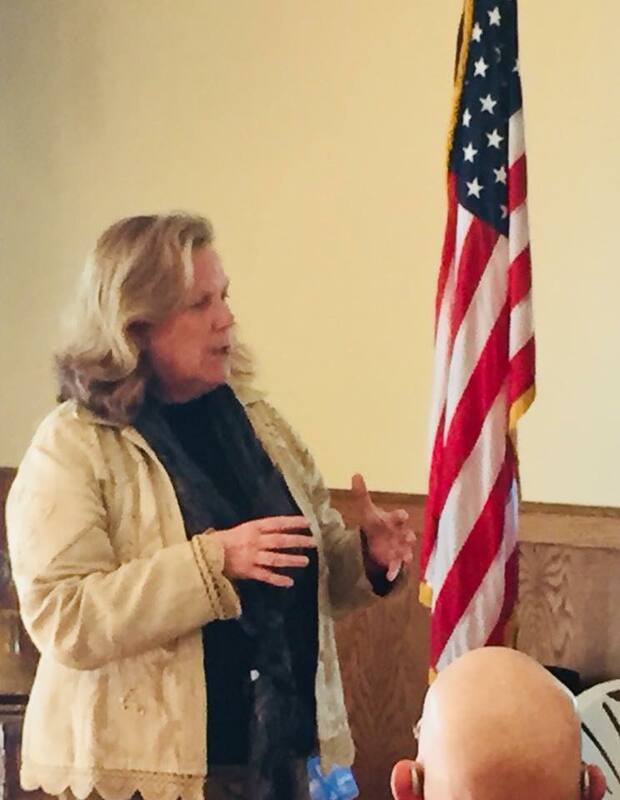 Tanya stated the District receives minimal funding from the State as it designated rural and is located in an affluent area; however, State requirements and mandates are the same as for the schools which receive a lot more funding, thus creating a difficult financial situation ‘a head if not prevented. She explained the details of this old money-allocation-model based on tax assessments when properties are turned over. But apparently only approx. 20% of the 750 parcels turn over on a yearly basis. 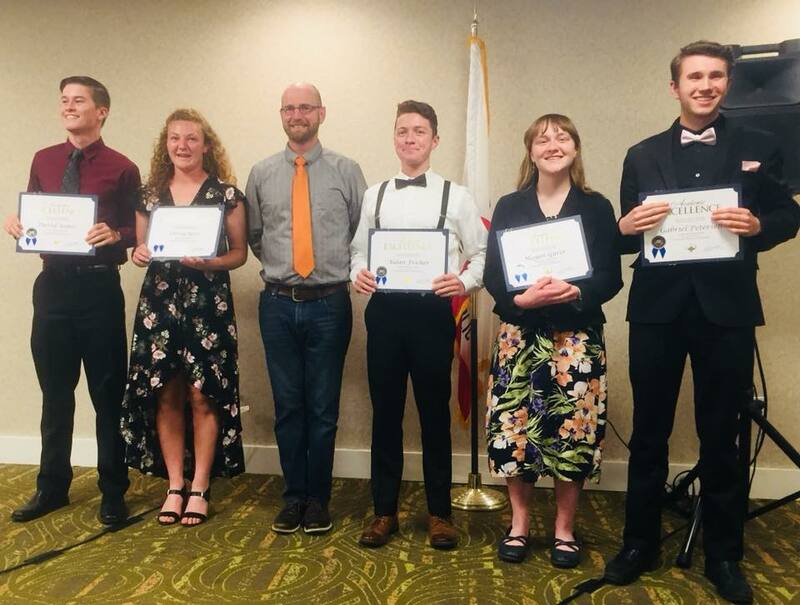 Derek is the SV Chamber of Commerce Man of The Year. 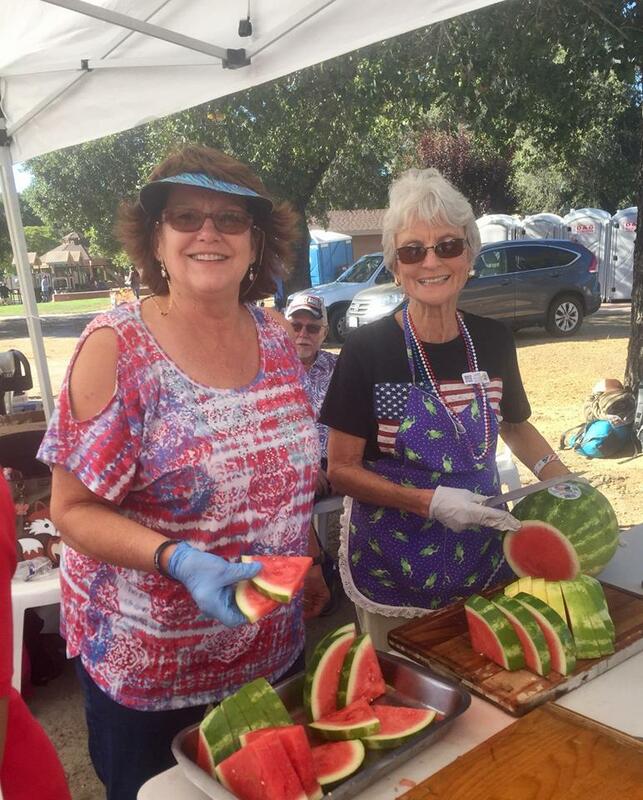 He wears lots of hats in service to the people of Scotts Valley. 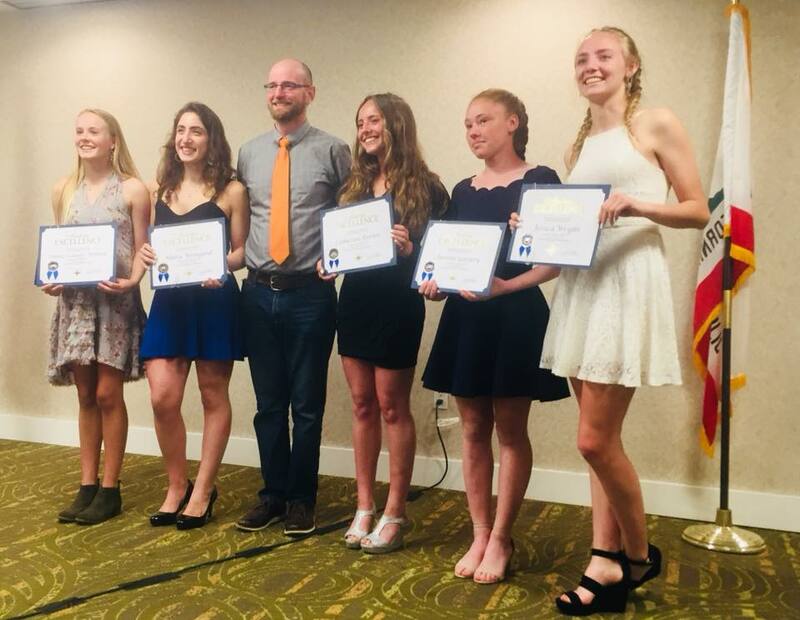 He is currently the President of the Scotts Valley Education Foundation, which has had a major role in helping to fund various schools activities. 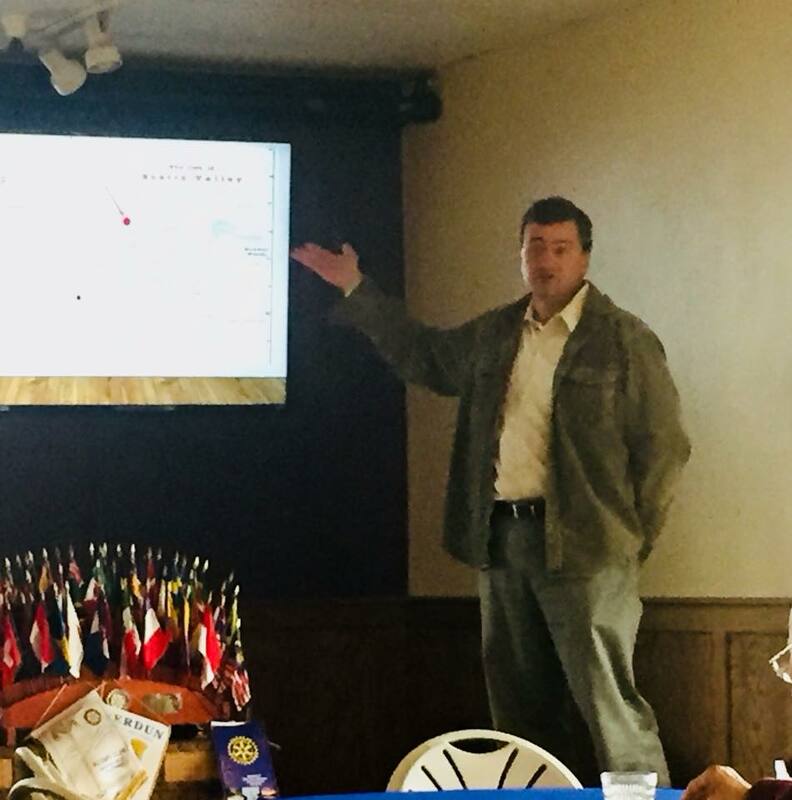 Tanya and Derek shared info about the District and about the Parcel Tax being considered to help keep the District afloat in the coming years. The proposed parcel tax will not be used to pay for teacher pensions nor salaries. We are one of the safest school districts in the nation said Derek, and have high tests score, but we are still in need of basic funding. 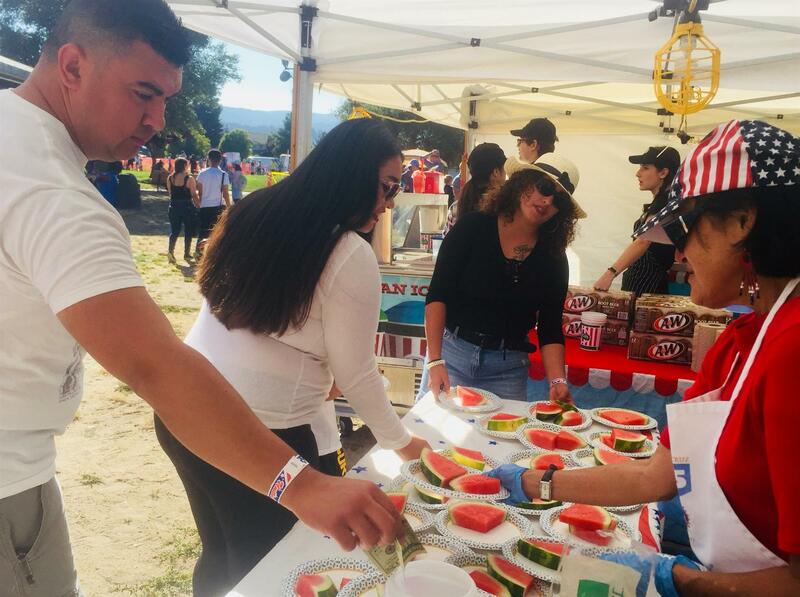 The Touch a Truck, Facebook Matching Funds, Friday Night Food Trucks and many other fund raising activities raise good moneys but are not sufficient; and we are maxed out in these voluntary donations. 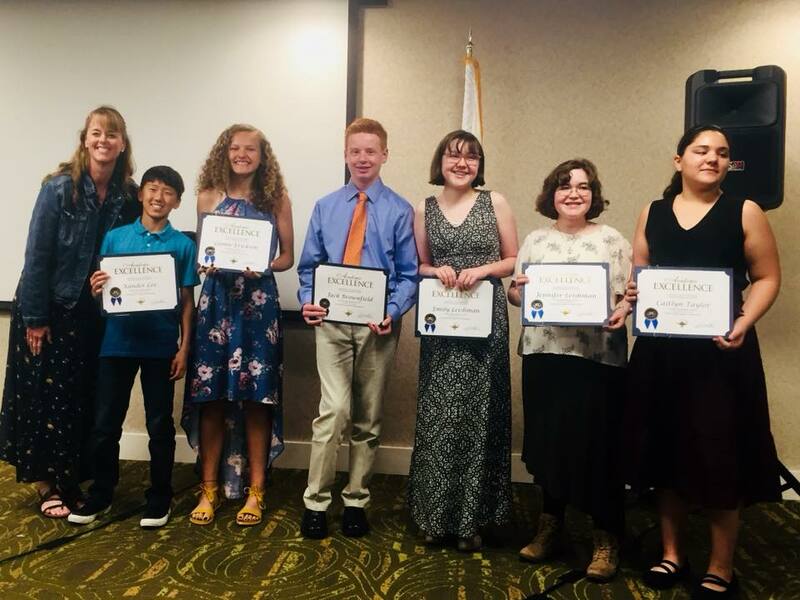 Scotts Valley Rotary Sustainability Committee sponsors the Marine Debris Ocean Stewardship Program. 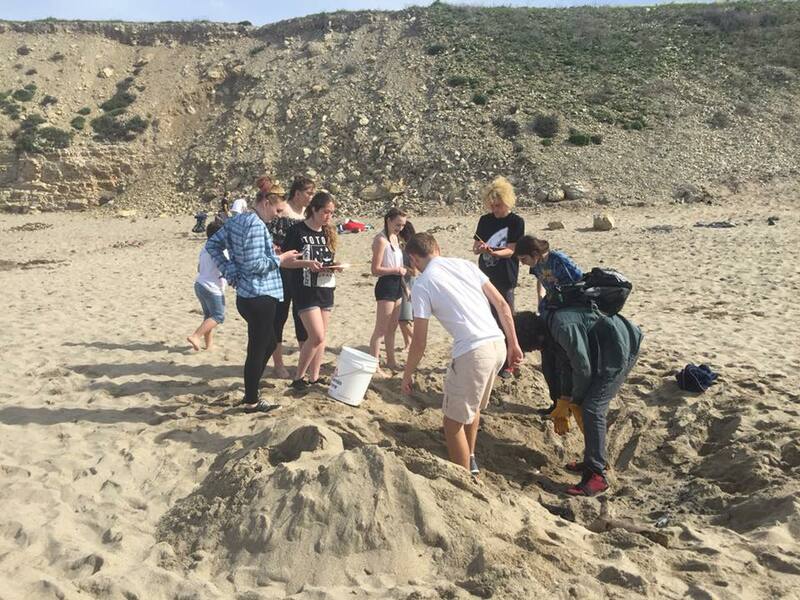 This was the second field trip for students from Scotts Valley High School to Davenport Beach, on March 29, 2018. .
A portion of the grant funds are allocated to reduce plastic pollution in the ocean starting on the campus. 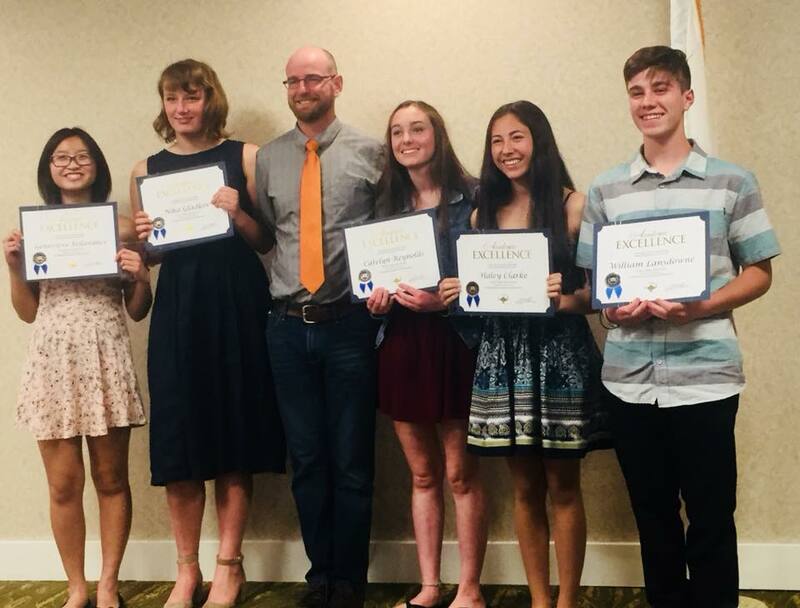 The GreenTeam at the High School leaded by Mark Andrews, Environmental Studies Teacher, have built and are enhancing a sustainable organic garden! Learning to drain only clean water into the watershed going to the ocean. 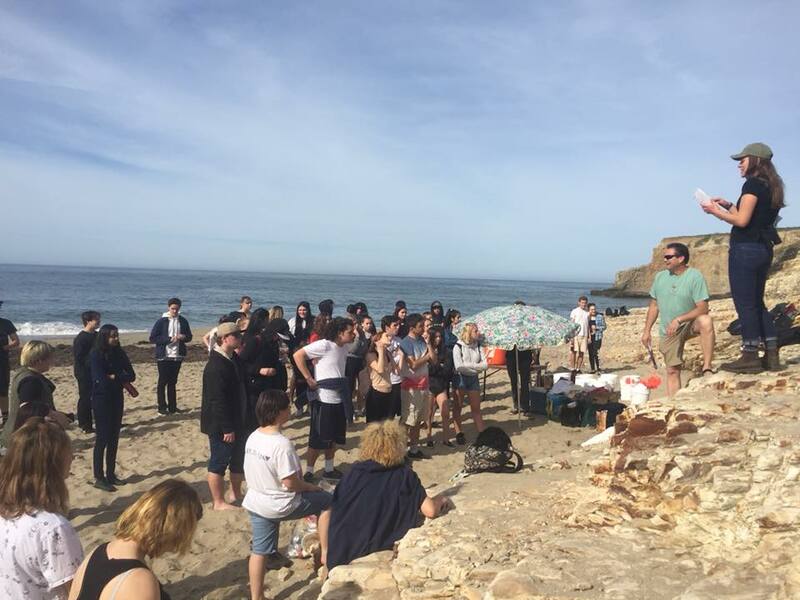 All together 150 High School students participated in this “marine debris survey.” Many youngsters camp at this beach overnight and although many pack their trash, few take it up the steep cliff to be disposed off. 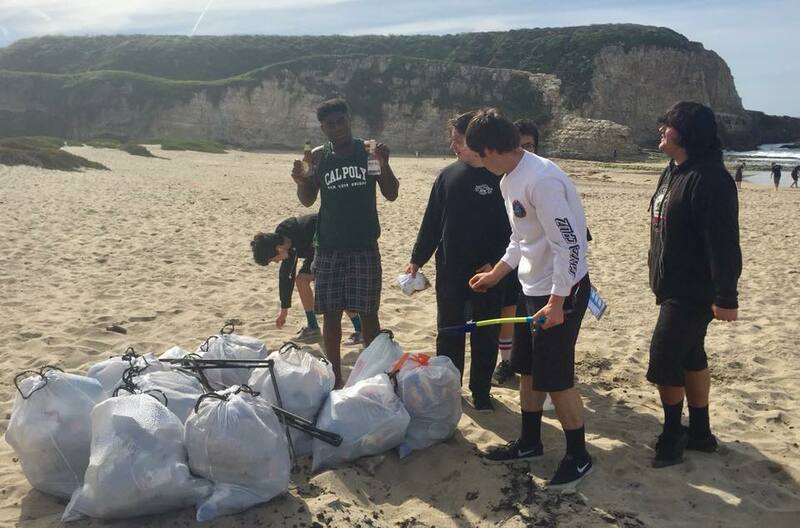 Looking at these pictures you can see in about an hour the students collected enough trash (already bagged and hand picked)to fill up almost 3 big containers up at the parking lot. The plastic and other trash was logged in worksheets. The students later in class input the info into the NOAA Marine Debris National Data Base. Really a great data to help ocean policy development. 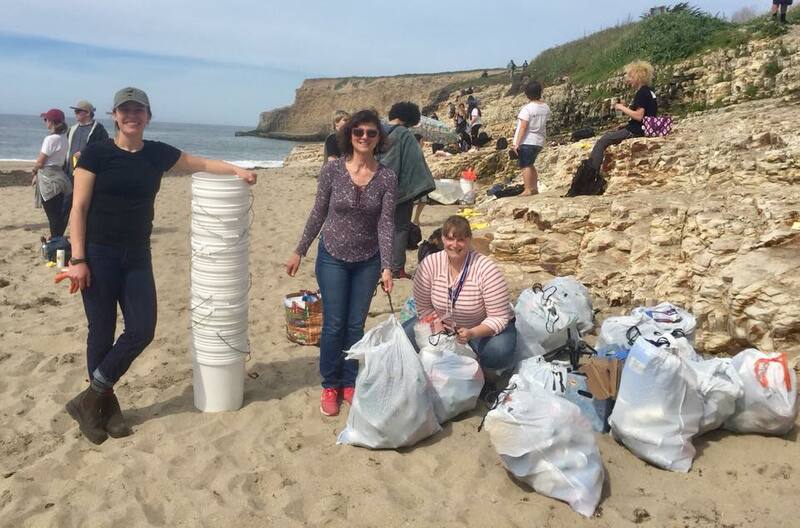 This is a hands-on experience that hopefully will teach students to refuse single-use disposable plastic, and protect the health and integrity of the ocean ecosystem. 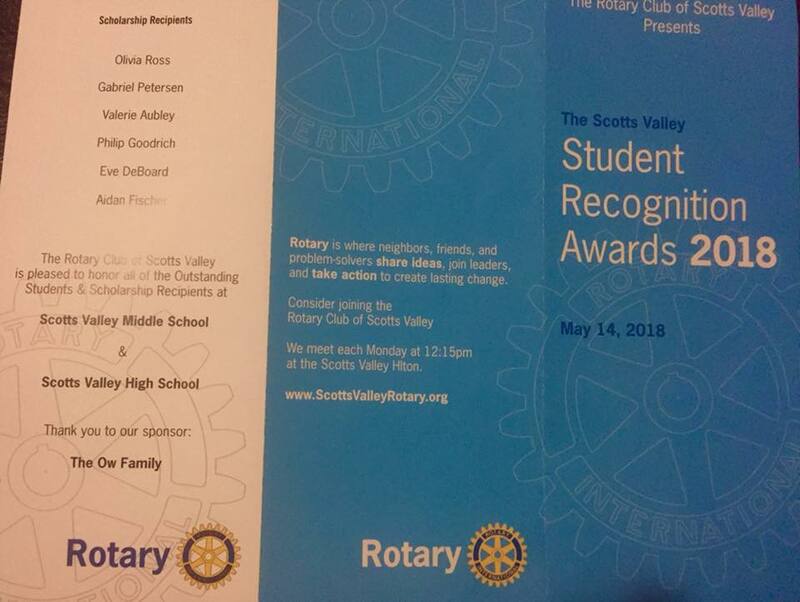 Student Recognition and Rotary of Scotts Valley Scholarship Awards. 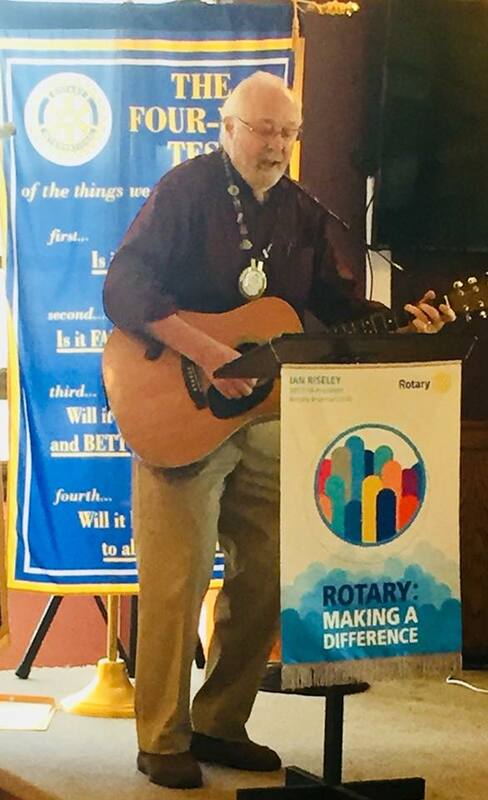 Bill Holl, our President starts the meetings with a nice sing along song! Chief Kovacs has 36 years in the fire service, starting in 1981 with the Ebbetts Pass Fire Department where he worked 31 years! 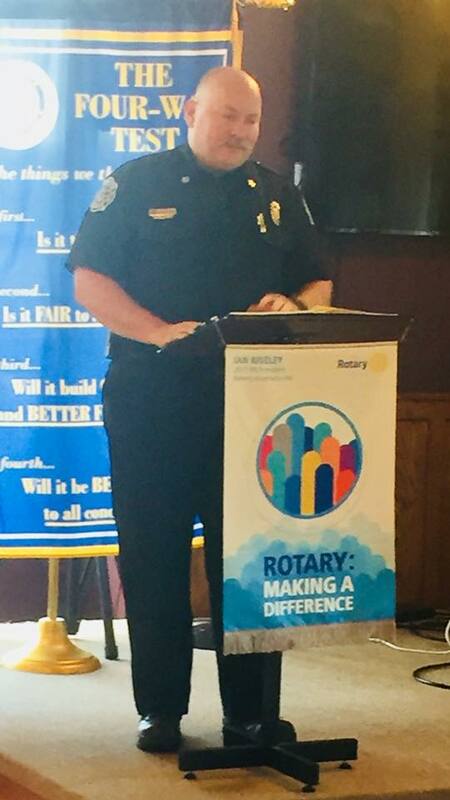 He also worked in the Murphy Fire Protection District and became a Chief. Now is is our Fire Chief. He stated that we know the big weather events are coming and about when they come so we prepare for it. “Significant weather events raise risk of major forest fires” so we join forces with Fire 🔥 Fighters all over the State and send many engines where we can estimate or where we know there will be a significant weather event. We need to concentrate our resources to save people and animals, so some time that is why you see big fires stay on. We can mobilize many engines in short time but our automation dispatch centers are lagging behind. 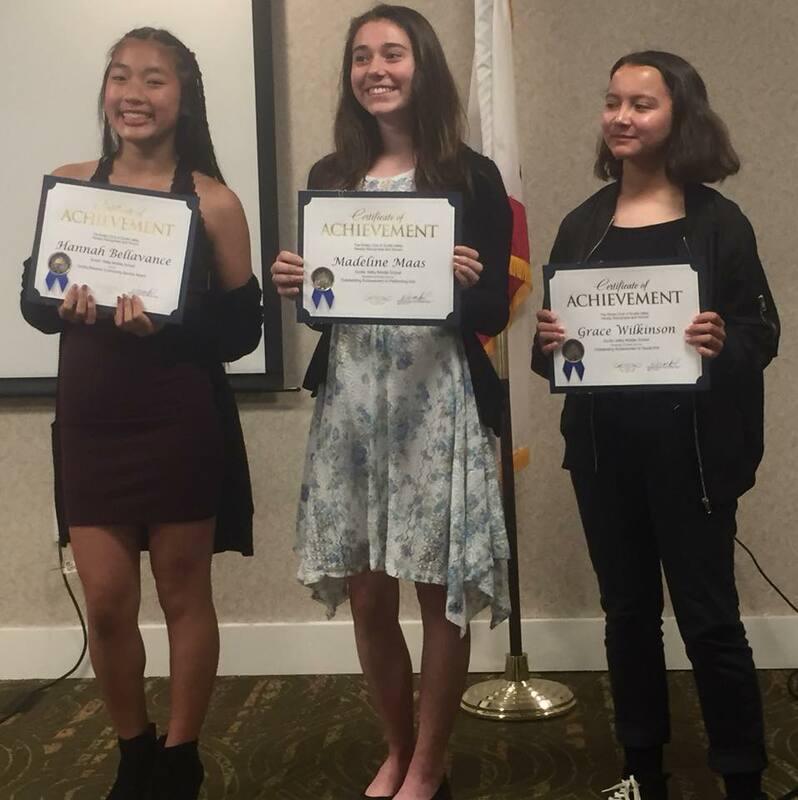 We need support for more funding for California fire 🔥prevention and safety. 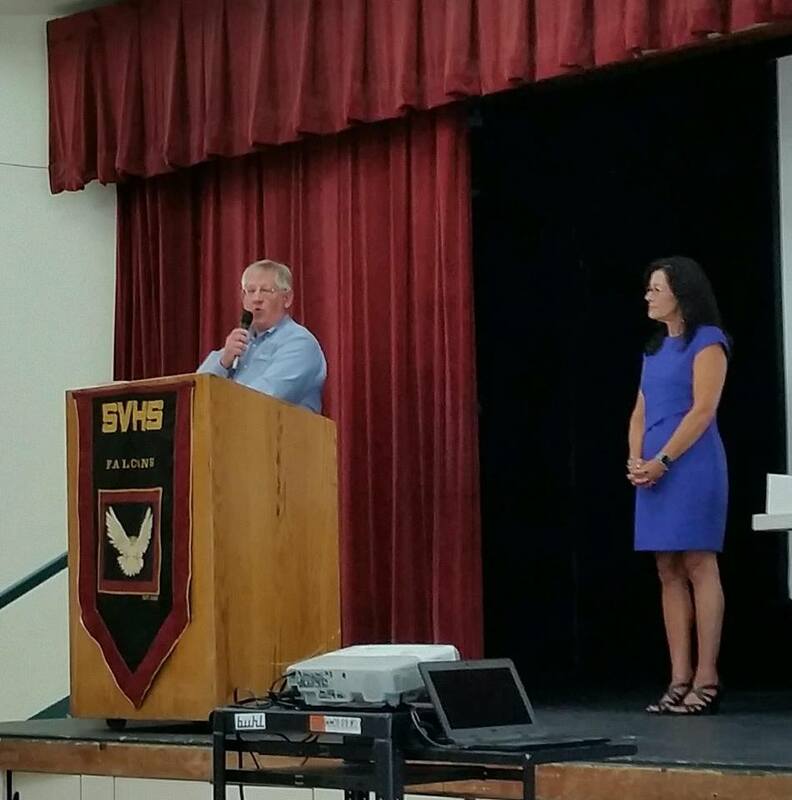 Margaret Bruce, Board Member at the San Lorenzo Valley Water District. 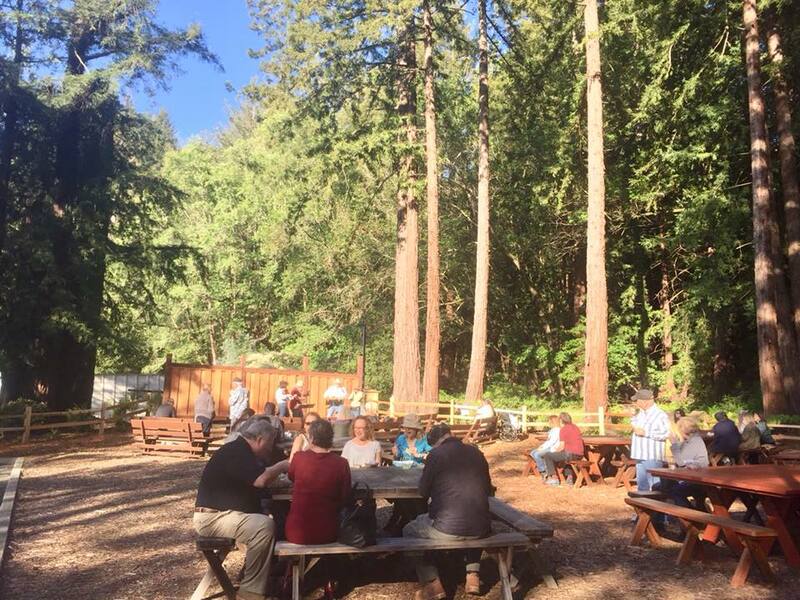 Margaret stated that many of the Main Water Lines are only 2 inches in diameter and used to be adequate for the original vacation cottages, but are no longer adequate to protect the urban areas and much less hold back a potential wall of fire from huge forest in our area. Brian Lee, General Manager, said replacement of water lines infrastructure is an on- going task in this field. The plans are to replace the 2-inch lines with 6-inch lines. And while the State is working on a sustainable water plan for California we are self sufficient. Although we participate as needed. 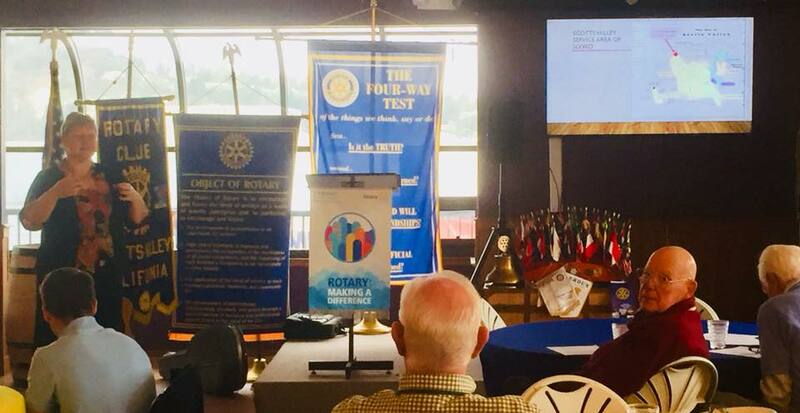 Sergio Faleta from Spain, made a good speech for us sharing his achievements, his native country, and how thankful he is for the opportunity. 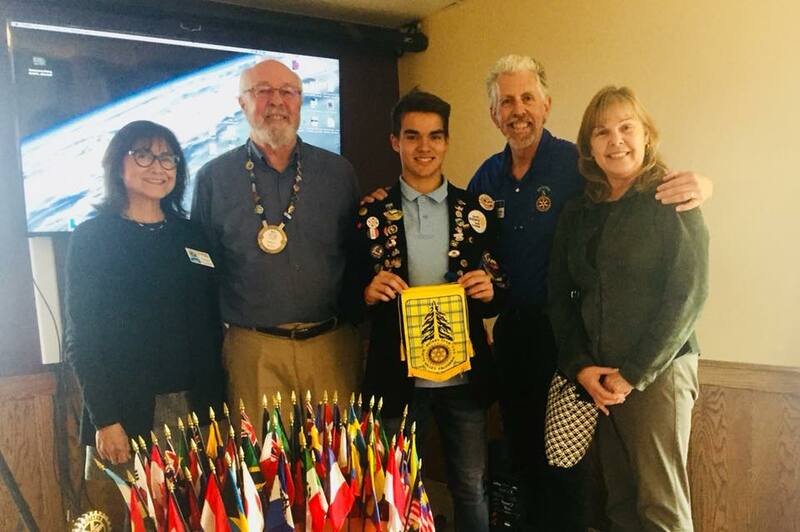 Here with his American parents from the Rotary Club of Pleasanton, Bill Holl our Club President, and the Rotary Exchange Program Representative/Coordinator Darlene De La Cerna. Rayne works for the County Administrative Officer. She works with all of the government and private non-profit agencies that provide services for the unhoused population in our County. 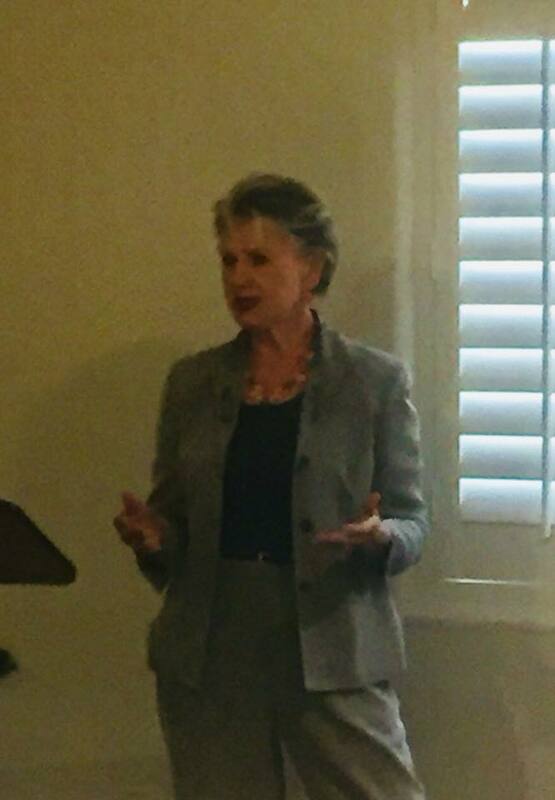 She provided insight into the Homeless population— 25% are youth, many become homeless after leaving from foster homes; 25% families who lost a job or their home; 25% previously working adults in the same situation; and only 25% are the Homeless who you and me see on the streets! Providing housing and a job to the homeless is fundamental, but emergency/and basic services are the first step to have access to them and help them to stabilize and be able to return to normal life. Incredible information that all of us should have to reduce the stigma of homelessness.